A pencil drawn kimono pattern with ornate decoration including serpents, coy, a stormy sea, heron overhead and more. .c1920s. What appears to be a complete handmade paper pattern for a kimono complete with hand penciled design for embroidery or appliqué that includes scenes of a violent sea, sea serpents, herons flying above a sailing vessel and more. Proposed colors have been penciled on the pattern. The back piece measures 48" x 32". Reverse is blank. Appears to be from the 1950s. .
Two hand-made posters by Anna-Louise (Rudin) Falk. She was an artist who lived in Connecticut and was known for portrait and still-life painting, illustration. These two posters are advertisements for events, the first a play and the second a charity event. "Nothing But The Truth" appears to be the play based on novel of the same name by Frederic S. Isham. The play is a comedy about a stockbroker who must tell the truth for a whole day. The illustration accompanying the poster appears to be the logo for the performers, 'Parish Players', as the eyes are two 'P's. Measures 18 3/4" x 14"
"Tulip Tea" is a poster advertising a benefit hosted for the Branford Visiting Nurse Association in May 1925. Tickets were 35 cents each, and there was food, candy, dolls, baskets, toys, and a picture gallery. The poster itself has two whimsical renditions of tulips on either side of the text, in color (red, yellow, orange, and green). The title of the poster, Tulip Tea, is done in a gradient of red, yellow and orange. There are pencil marks seen beneath the text and drawing and was obviously used as a guide for the design. Measures 22" x 14".. The 'Tulip Tea' poster has a tear on the bottom right corner, approximately 3". As well as 4 small pin holes from when it was displayed. "Nothing but the Truth" has one pin hole at the top center. Minor toning/ fading due to age/light damage. This binder belonged to Geraldine "Gerri" Kurnentz during her time as a student at the Fashion Institute of Technology in New York. The binder contains two distinct courses on ladies wear garments and their corresponding work. Each section starts with the syllabus for the course, followed by Gerri's work and various handouts. These typed syllabus and instructional handouts provided by the school are often stamped with her teacher's name, such as N. Angelier (Nancy L Angelier) and F Leto. 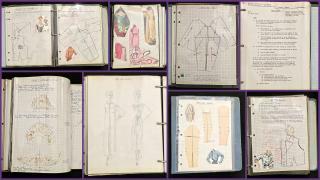 The two courses featured in this binder are Pattern Drafting and Design taught by Angelier and Apparel Design, taught by Leto. The coursework often consists of hand-drawn miniature patterns- drawn to scale- which are pasted or pinned onto graph paper. On particularly difficult tasked, such as the inclusion of a notched collar, multiple tiny pattern pieces are affixed to the drawn pattern with straight pins. At times these patterns are also made from canvas or tracing paper which has been pinned into the graph paper. Along with the patterns are her notes and magazine cutouts of illustrations of the articles of clothing she was attempting to make. Interspersed between all of this are a few newspaper articles she found interesting and a few fashion sketches. It is unclear if these sketches are Gerri's original designs or simply sketches of the dresses she was trying to create. Some of the techniques and/or patterns she learned in these two courses are: a Notched collar, a Dolman Sleeve, a Ragian Sleeve, a elongated armhole, a petal skirt, and a princess dress. 2 in, 3 ring binder with blue fabric covers. The pages of the binder are encased in plastic sleeve inserts, of which there are 67 (including the one on the front cover). As such there are approximately 134 (a few plastic inserts are single sided). The binder dates from the mid 1950s, but no later than 1958, as Gerri was married in that year and her name changed to Schrier. Measures 11 1/2" x 10 1/2". Geraldine "Gerri" S Kurnentz was born on September 3, 1938 to Sidney Kurnentz and Bessie Kurnentz nee Schwartz. She married Richard Schrier in New York in 1958. She eventually moved to New Jersey and had at least two children. Gerri died on July 3 2017.